Rice University scientists have developed and evaluated analogs of potent anti-tumor agents known as epothilones using designs and methods that both improve their biological properties and simplify their manufacture. The substances introduced by Rice synthetic organic chemist K.C. Nicolaou are similar in their cancer-fighting mechanism to paclitaxel, the drug for which he is best-known, but have superior properties. Some compounds of the dozens of variations the scientists created exhibit potent cytotoxicities against certain cancer cells, including a drug-resistant cell line, Nicolaou said. The new research study is described this month in the Journal of the American Chemical Society. Like the family of taxanes (of which paclitaxel is a member), epothilones prevent cancer cells from dividing by interfering with tubulin proteins that form the cells' skeletal microtubules. Tests with kidney cancer and two human uterine sarcoma cell lines, one with multidrug resistance, showed that 10 of these new compounds were impressively potent against all three cell lines, the researchers reported. "This is another example of a larger theme in our research, that of the synthesis of complex, rare natural products and their analogs for biological investigations," Nicolaou said. "Our work is directed toward drug discovery and development in collaboration with biotechnology and pharmaceutical companies, particularly in the cancer area." The drugs are variations of epothilone B, a natural product isolated from Sorangium cellulosum, slime bacteria that live in soil. Nicolaou and his colleagues achieved the total synthesis of several of the natural products and related substances in the past, but those compounds proved too toxic to be used as anti-cancer drugs, he said. "These new results are significant because they represent the discovery of a number of more potent variations of the natural product as cytotoxic agents against cancer cells," Nicolaou said. "This brings these members of the epothilone class within range of suitability as payloads for antibody-drug conjugates, a new paradigm for targeted cancer therapy." Just as important, he said, is the lab's ability to add chemical "handles" to the molecules that allow them to be attached to drug-delivery systems like cancer-specific antibodies. Nicolaou compared the reconfiguration of epothilone B, the starting material for their synthesis, with the transplant of body parts, as he and his team replaced components in the molecule to make the designed analogs more effective. "The strategy we developed to synthesize them can be described as a kind of chemical surgery," he said. 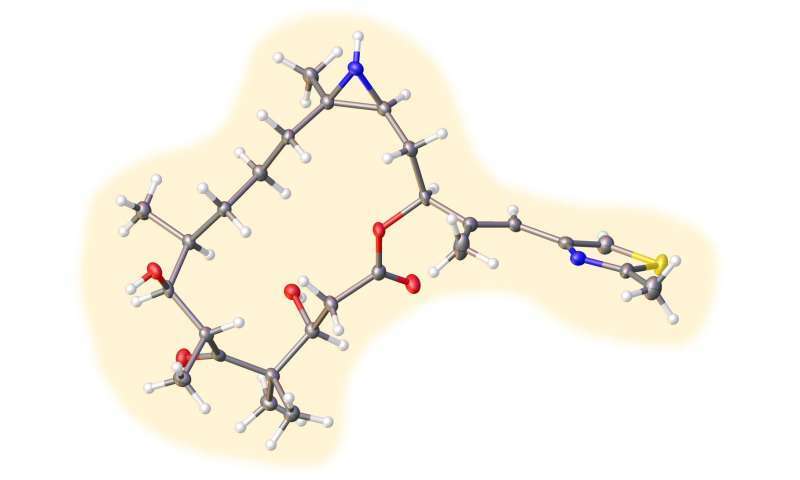 "The most important structural motif we introduced in these new molecules is the three-membered ring containing a nitrogen atom, a so-called aziridine moiety." 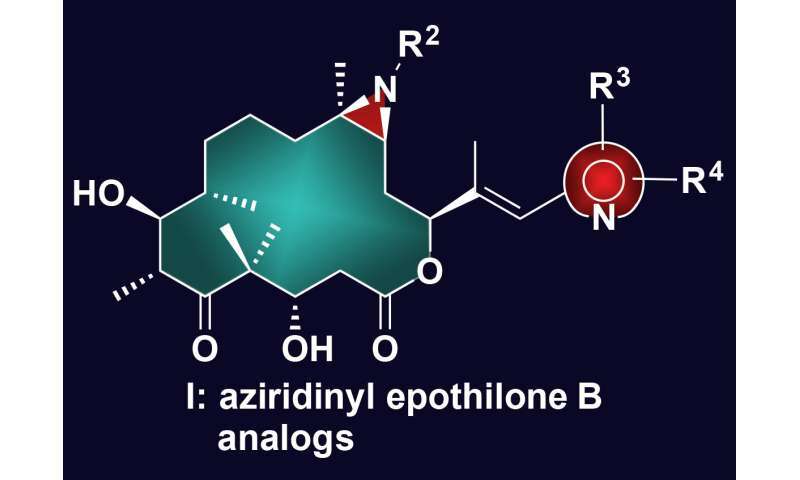 The importance of the aziridine ring is not yet clear, he said, but it could serve as a handle to attach the molecule onto an antibody through a linker. "The other structural motif, the so-called side chain with a basic nitrogen embedded at a strategic position, was achieved through new extensions and improvements developed in our laboratories of the previously known HWE (Horner-Wadsworth-Emmons) reaction," Nicolaou said. "The HWE reaction is an important process for making olefinic bonds (carbon-carbon double bonds) stereoselectively." He said the new line of research was made possible by the work of Rice colleague László Kürti, who with his team developed a "powerful reaction" that offered a simple, scalable and fast method to synthesize aziridine rings from olefins. That research led by Kürti, then of the University of Texas Southwestern Medical Center, John Falck of Southwestern and Daniel Ess of Brigham Young University was reported in Science in 2014.